Nuclear technology has long been recognized as capable of both tremendous benefits and tremendous destruction. With this in mind, countries have devised international arrangements intended to promote peaceful nuclear applications while preventing the spread of materials, equipment, and technologies useful for producing nuclear weapons. Today, however, it is clear that this global nonproliferation regime is falling short. North Korea withdrew from the Nuclear Nonproliferation Treaty (NPT) in 2003 and has since tested two nuclear devices. Iran, while still a party to the NPT, has developed the capacity to enrich significant amounts of uranium; many believe it is seeking to build nuclear weapons or at least attain the ability to do so. In addition, there is the challenge of facilitating the expansion of nuclear energy, something that could help reduce carbon emissions, while preventing countries from using related technologies for military purposes. Finally, the prevalence of nuclear materials only intensifies the fear that terrorist groups could acquire them through theft or a deliberate transfer from a state. Given these challenges, it is fitting that nuclear issues are near the top of today's foreign policy agenda. President Barack Obama organized a nuclear security summit in April to discuss ways to secure nuclear materials and reduce the threat of terrorism, and NPT signatories will gather in May for the five-yearly NPT review conference. The United States and Russia have reached a successor agreement calling for further reductions in their nuclear arsenals. And the United States and others continue to pursue both sanctions and negotiations with the aim of limiting Iran's nuclear capabilities. Today, it is clear that this global nonproliferation regime is falling short. 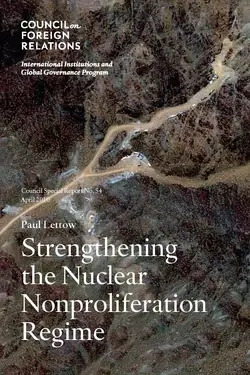 In this Council Special Report, Paul Lettow examines the shortcomings of the nonproliferation regime and proposes a comprehensive agenda to shore it up. He first explores the challenges facing current arrangements, chief among them the spread of enrichment and reprocessing technologies needed to produce fissile material. Lettow then makes a variety of recommendations. First, he calls for tighter sanctions on Iran with the goal of dissuading it from continuing its nuclear advances and discouraging others from following Tehran's path. To combat the spread of enrichment and reprocessing, the report urges the United States to lead nuclear suppliers in developing a system that would allow the sale of relevant equipment and technology only to countries that meet demanding criteria. As regards a potential multilateral nuclear fuel bank, the report argues for limiting participation to states that have a strong nonproliferation record and agree not to make their own nuclear fuel. Lettow further recommends a larger budget, more authority, and various policy changes for the International Atomic Energy Agency so that it can better detect dangerous violations of nonproliferation agreements. Finally, he urges a series of steps in the United Nations Security Council to punish violators and deal with countries that seek to withdraw from the NPT while in noncompliance with their obligations. Strengthening the Nuclear Nonproliferation Regime provides an authoritative look at today's nuclear-related concerns and what can be done to address them. With its thoughtful analysis and comprehensive recommendations, it makes a strong contribution on a subject of vital importance. And given the challenges now testing the nonproliferation regime, as well as the issue's prominence in the foreign policy debate, the report could not come at a better time.